If you want to keep your body solid like a rock and love strength training then it is very important to have this one of the best power racks. With The Powertec Fitness Workbench Power Rack, you can hang on them, climb on them, and connect other fitness accessories to create more exercises for a varied workout. Strength training does great things internally and externally for your body. It improves the health of your heart, makes you stronger, builds strong bones and helps you lose weight fast. However, let’s take a quick look at this product to see whether it suits your active lifestyle or not. This power rack has made its way into the basement gyms and the garage of many fitness enthusiasts. Over the years, it has undergone numerous upgrades to adapt to consumer’s strength training needs. Product material: A steel tubing frame coated with a black paint finish that resists rust and corrosion. To simplify it, The Powertec Power Rack is made up of metal tubing that’s completed with black paint. It stands seven ft tall, measures about 4 and a 1/2 ft wide and about 4 ft long. This rack weighs around 270 pounds when it’s totally assembled. 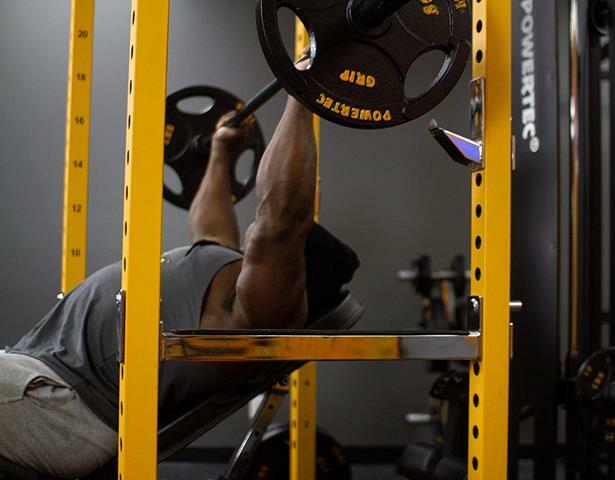 By itself, the power rack can support 1000 pounds, and the dip bar and chin-up bar can keep 400 pounds. With these kinds of weight capacities, the power rack is sturdy enough to stand up to rigorous exercising routines and heavy equipment. A strong and durable steel creation that can handle strength training workout and large weight limits. • Lets you execute a wide range of exercises for your entire body. • You can attach a variety of fitness accessories. • It has improved and new chin-up bars and Olympic bar safety catches. • A new numeric system that is simple to read set and adjust for connecting accessories. • Brand new Gravity Lock Safety catches will keep you safe every time you exercise. • Dip accessory (WB-DMA13) is included. Thanks to all the separate additional fitness accessories that are available with this Powertec Power Rack. You can easily customize this Power Rack system into a gym or garage which will help to achieve your fitness goals. Powertec Power Rack warranties do not offer coverage for commercial use but for home use only. A lifetime warranty covers the frame, not including the surface finish. One year of coverage for pads, grips and undefined parts. Two-year protection for parts, not including spring pins and bearings. On Amazon, the Powertec Power Rack sells for under $700. It ships for free to 48 states, excluding Hawaii, Alaska and U.S. Territories. The International shipping of this power rack is unavailable. There are no special delivery services available at this time. The Powertec Power Rack is a heavy piece of fitness equipment that is shipped in pieces. It arrives with steel tubes, washers, nuts, and bolts. You need tools to put the power rack together. To help you an assembly guide is included. Now it’s time to consider the pros and cons of the Powertec Power Rack system to better decide whether this fitness equipment is worth buying. The Powertec Power Rack has a solid steel construction that has been updated and can withstand hard workouts and support high weight limits. With the power rack, you can perform different strength training exercises that will boost your normal workout routine. There’s always a risk of injury when working with fitness equipment. That’s why the Powertec Power Rack has added new and improved safety features to keep you safe during your training routine. It’s easy to turn it into a custom strength training gym. You can choose from over 20 different Powertec Power Rack accessories to add to it for a complete workout. The best thing about this power rack is that it allows you to train your strength, which is in itself a reward. 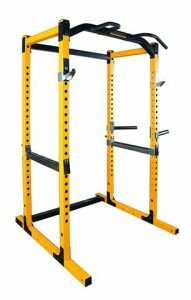 Most people who bought this power rack enjoyed the quality, durability and how much it has enhanced their strength training experience. However, some customers had a minor complaint about how the power rack slightly oscillates while using the dip bar. Unfortunately, it does not come with feet to secure it to the ground. Answer: There are no changes in term of durability and safety from PR11 – PR16. The Max capacities have remained almost the same throughout the last 3 iterations, at 1000 lbs. The biggest changes for the WB-PR16 from previous models are mainly the ability to accept a variety of attachments and the better powder coat matte finish. Question: Does anyone know where I can find a straight pull-up bar for the Powertec power rack instead of the ergonomic pull-up bars? Answer: You can get it from the Powertec official site. The Multi-grip pull up replacement offers many different grip positions with the straight bar. Question: Are the safety spotter bars easy to take out and put back in? Have I never used that type and was wondering? Answer: Yes, the spotter bars can be taken out or moved into a new position very easy and fast. I have been using the Powertec Power Rack for the last four months and like very much the ease of moving the elements (spotter bars, barbell hooks, weight plates horns) in the required position. Question: What is the minimum ceiling height required in order to accommodate a standard pull up for the machine? 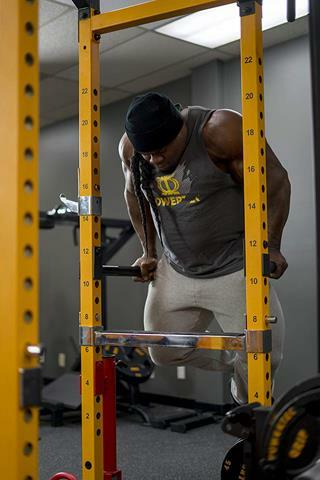 Answer: The Powertec Power Rack (WB-PR) is actually 84 inches high. For optimal pull up work out, you will need 12 inches clearance above that. The most average home ceiling is 96 inches tall and should accommodate for that. I have seen some of our customers set up with only 6 inches of clearance in their basement. This rack is fantastic. It provides everything I need to lift moderately heavy weight at home without a spotter. However, it tends to wobble when using dip bars. I could try to use them inside the cage rather than outside until I put this thing in the concrete of my garage with redheads. Otherwise, it’s rock solid and has several great accessories. Powertec Fitness Work Bench Power Rack is very sturdy and easy to put together. It’s not a huge rack so it’s ideal for garages/basements. It was very well packaged with simple instructions and durable material. The Shipping was a bit of a hassle but the product is solid. I had 405 on the rack without problems and it’s not bolted down. My only complaint is that they should include the feet to screw it with the rack instead of an additional accessory. The Powertec Fitness Workbench Power Rack is designed to last, can work with a variety of accessories and allows you to perform more powerful exercises. Basically, it does everything it should do as a power rack. Fitness enthusiasts adore it, and negative criticism is minimal.